"We are going to arrest, prosecute, and convict fentanyl dealers and we are going to put them in jail," Sessions said. Drug overdoses—of which there were some 64,000 fatal instances in 2016—are the leading cause of injury death in the United States, and have single-handedly driven down the life expectancy of white Americans. In his speech, Sessions said the data for 2017 suggest we are not out of the woods yet. "Preliminary data show that the drug death toll continued to rise in 2017, but at a much slower pace. And according to CDC data through November 2017, it appears that we are starting to making progress," Sessions said. Although the rate of prescription opioid overdoses has risen steadily for years, the major driver of the OD death boom in the last several years was first heroin, and then fentanyl and other synthetic opioids. The Center for Disease Control said Thursday that the supply of synthetics is increasing, projecting more synthetic deaths in 2017 than in 2016. Fentanyl and its analogs are synthesized abroad, usually in China, before being smuggled into the United States over the southwestern border or through the U.S. mail. Incredibly small doses are sold, often heavily diluted or "cut," meaning that fentanyl dealers can make millions of dollars in profit off of a single package. S.O.S. will focus on the ten federal districts hardest hit by the opioid epidemic: two in West Virginia; two in Ohio; and one each in California, Kentucky, Maine, New Hampshire, Pennsylvania, and Tennessee. Prosecutors in those districts will each select a single county in their district and prosecute "every readily provable case involving the distribution of fentanyl, fentanyl analogues, and other synthetic opioids, regardless of drug quantity." They will also coordinate with the Drug Enforcement Agency to escalate street-level busts up the chain of command. "I want to be clear about this: we are not focusing on users, but on those supplying them with deadly drugs," Sessions noted. 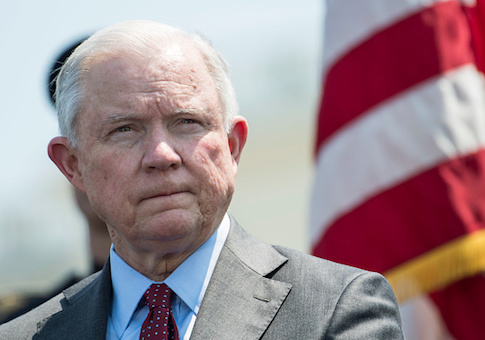 Sessions said the aggressive prosecution strategy was responsible for a 22 percent decline in opioid overdose deaths in the Middle District of Florida. After 45 prosecutions, he said, the Manatee County, Fla. Sheriff’s office went from responding to eleven overdoses a day to just one. To put federal muscle behind this push, the Department of Justice will send an additional federal prosecutor to each of the ten district offices taking part in S.O.S. "We know that our mission is difficult—but it’s not hopeless. Together, we can break the vicious cycle of drug abuse, addiction, and overdose that has devastated countless American families," Sessions said. This entry was posted in National Security and tagged Jeff Sessions, Opioids. Bookmark the permalink.